A plate of molasses as an artificial horizon for sextant sights. To get an optimum height, we use a box on the stool for coarse adjustment, and fine tune with some random book. The plate only has to be level enough to keep falling off the box. The nice thing about using a plate of molasses for an artificial horizon is if you spill some you can just lick it up. After a week or so it firms up a bit more than you want, so just put a teaspoon of water on the surface and put it in the microwave for a minute, and you are good as new. We have used the same plate of molasses for several years! Molasses is thick enough that the surface is not affected by a light wind, which would render a water surface useless. Some use thick dirty motor oil, but we have already pointed out why molasses is better than that. 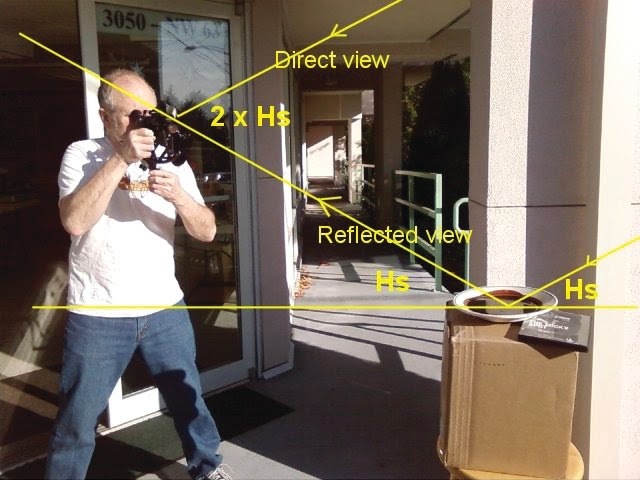 We explain the nuances of taking sextant sights with an artificial horizon in our text How to Use Plastic Sextant – With applications to Metal Sextants and a Review of Sextant Piloting. This book is available as an ebook for $5.99. The title of that book, by the way, is a bit misleading. It covers the best ways to take sights with all sextants, metal and plastic. It is just much more important to do it all right if you use a plastic one. Following the methods of that book, you will get usable and dependable sights from plastic sextants. Following the same techniques with a metal sextant will reduce the scatter in your data and lead to optimum results possible from cel nav. 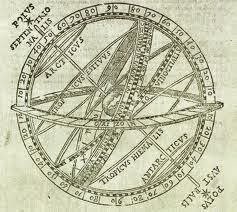 The Celestial Sphere. May It Rest in Peace. Our goal is to teach practical navigation in a manner that is both functional and understandable. We want students to know how to do it, and why it works. This means we do not include formalism that is not needed to understand how something works and how to apply it, and we very especially do not cover topics that do nothing but obfuscate the subject, no matter how ubiquitous the terms or concepts might be in the standard teaching of the subject. In fact, we don't even use words like "obfuscate" and "ubiquitous" in the classes. Celestial navigation has a couple real dillies that must be shot down and stepped on immediately if they ever come up in class. I will tell you a funny story about one of them, the celestial sphere. Poor navigation teacher having to haul around the celestial sphere. Break your chains. Throw it out. This topic did indeed come up today in class, so it gets immediate attention. In about 2005, I was invited to give a lecture to the first ever graduating class to receive a BA degree sanctioned by the state of Washington with a major in Astrology. (The state approval of this degree was one of those rather momentous events that no one hears much about in the news–like when Canada gave back Nunavut to its native owners.) The degree granting agency was Kepler College, who had rented space for this training at Bastyr Univesity campus. Bastyr is one of the world leaders in natural medicine, and have no relationship at all to astrology that I know of. They do have a beautiful campus; I have attended seminars there on various subjects unrelated to natural medicine. It was a class of about 30 students, just a course or two away from graduating with what has become an even more unique degree. The WA state sanction did not last long beyond that first crop of students. My job was to discuss how celestial navigation works. We have a more or less standard way of explaining this, but I assumed these folks had certainly been involved on some level with positional astronomy, so I mentioned in passing what are called celestial coordinates (equivalent to latitude and longitude on the inside surface of the imaginary celestial sphere), and how we do not need to concern ourselves with them if we want to know how the stars move around the sky. 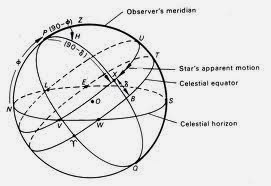 Then there were a few notable chuckles coming from the class, which made me pause, and repeat my self more emphatically....out right saying what the celestial sphere was and how useless it is, and how it will only cause confusion in your learning celestial navigation. It provides nothing you need, and makes it harder to understand what you do need. At that point the real belly laughs got rolling, and the whole class was involved. Which in turn was obviously also funny to me, but I had no idea what we were laughing about. Maybe I had a wardrobe malfunction? So I asked them what was so funny? "We just spent three full days on the celestial sphere," was the answer. It would have been an awkward moment if it was not so funny. So I joined them in the humor of the situation, and had to confess that they must need that for something else they are doing.... but you still do not need it for celestial navigation, and carried on with the story of how it works. It must be true then that not just astronomers but also astrologers use the celestial sphere, and sure enough most cel nav books start right out with a discussion of it. But all that time is wasted. 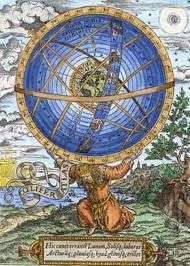 We do not deal with navigation in the sky, we navigate on earth, and all the coordinates that might be used in the sky to describe the location of a star, have a counterpart on earth that is much easier to comprehend and thus use in our work. Instead of referring to the position of a star as located on the inside of some imaginary glass sphere in the sky (sometimes described as having infinite radius; a nice concept to work with! 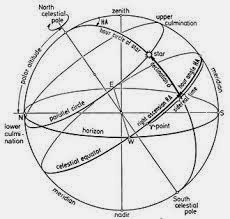 ), we can think of the location of the star as its geographical position (GP) on earth directly below the star, ie the point on earth where the star is precisely over head.... for a moment. The earth is rotating (360º of Lon per 24h), so the GPs of all the stars move west along the surface of the earth at 15º of Lon per hour. 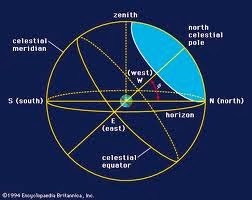 The latitude of the GP is the declination of the star; the longitude of the GP is the Greenwich Hour Angle. We do not need to think of declination and Greenwich Hour Angle as coordinates in the sky; they are perfectly good coordinates on earth. In fact, this is even a preferred way of discussing where stars are. If you are in Washington on the phone with someone in Florida, you can still say with perfect clarity where the star Vega is located at the moment. You simply tell your friend the lat and lon on earth where the star is precisely overhead at the moment–its GP. 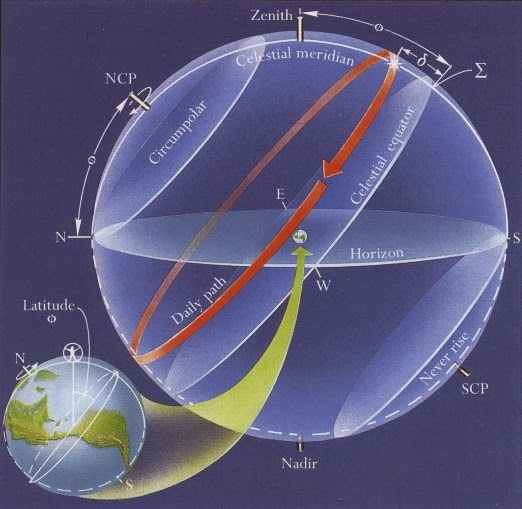 You can't for example say the star is NE about 35º high; that will be totally different in WA and FL at the moment, but the lat and lon of GP on earth is unique for that time and star. We do not need abstract coordinates on some imaginary sphere that does not rotate to understand where stars are and how they move. We put them on earth and let them move in a perfectly logical manner. Due west at 15º/hr, locked onto their unique constant latitude track we call their declination. In the typical cel nav text book it then just gets worse once this sphere appears. Then they start projecting various planes cut across the sphere, with the same planes on earth intersecting those, to end up with a massively confusing way to explain that the earth's axis is tilted 23.4º from the plane of its orbit. Then a few more planes and circles and arcs are added, and it becomes pure gibberish. 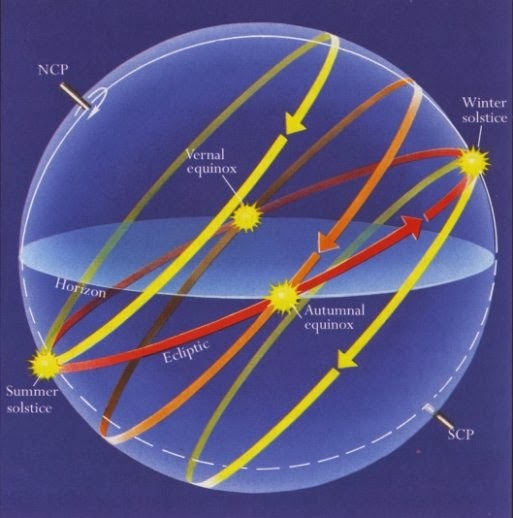 The motion of stars, apparent motion of the sun, definition of the tropics, and anything else we need to know about the motion of celestial bodies can all be explained perfectly clearly without the celestial sphere. Everyone can understand that the Big Dipper rotates around the Pole Star once a day without a celestial sphere. Let it please rest in peace. Here are some samples. Hard to tell what they mean. These are random pictures found online. When I can, I will post actual pictures from cel nav textbooks. They make my point much better.